Discussion in 'Online Casino Promotions' started by Marina, Sep 3, 2015. One of the biggest online casino promotions to ever hit the industry was launched this month – and players are flocking to selected gaming sites to try their luck. worth of prizes – one million for each year that Casino Rewards has been operating in the industry. Players have to opt in for the $15 Million Giveaway through promotions tab in their casino lobby to activate their golden tickets! Since 2000, Casino Rewards has been making millionaires out of players, and it will continue to do so between September 1st 2015 and November 9th 2015. During this time period, Casino Rewards will be pooling a percentage of all deposits made each week into massive, groundbreaking progressive draws. As such, all players will be given the chance to win some of the big prize pool. Every 50 deposited at Casino Rewards partner casinos will see players rewarded with one ticket. As such, the higher the player wagers, the bigger the chances of winning part of the prize pool! total amount of the jackpot by the end of the week. Players can view the progress of the jackpots by accessing the partner online casinos. A wide range of top online casinos are proud to members of the Casino rewards program, and these include Blackjack Ballroom, Casino Action, Casino Classic, Luxury Casino and more. What binds these casinos, besides the fact that they are partners with Casino Rewards, is that they are all powered by the top notch industry software supplier, Microgaming. 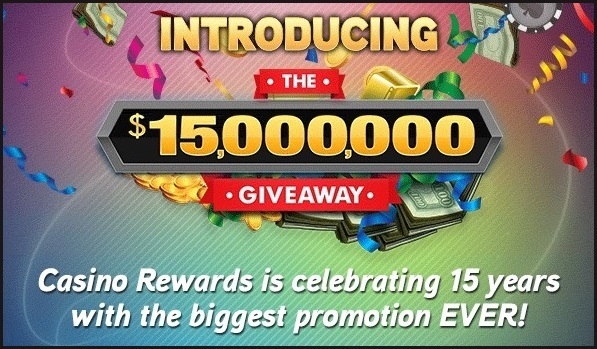 Players need to be a member of one of the partner sites in order to take part in the record-breaking $15 million Giveaway. They then have to opt in to the promotion before depositing funds into their accounts in order to qualify for the offer. between the beginning of September and November 9th 2015 , giving players ample opportunity to win part of this prize pool. of the many top sites in the program, enjoy generous deposit bonuses, as well as the chance to take part in the promo. I just opted in for this Mega Giveaway and just saw that I also get a really nice 150% match bonus on my next deposit. What a major promotion! Good Luck everyone! Congrats to the Casino Rewards Group!!! !